Taking photos of a large group can be a successful endeavor under the right conditions. Here are 7 tips you need to know when you're taking photos of a large group. Large group photos are common for family reunions, camping trips, and other large group events. Anyone can take a picture, but there are certain tips and tricks to taking great photos of a large group. Below are some of these tips. Soft light is best for a group photo. The best time to shoot during the day to get soft light is in the morning or afternoon. If you have to take the pictures halfway through the day, find a space where you can shoot the group under some shade, like a tree or building. Take a large group photo with a clean background so that the focus is on the group. Try to find a space that is open and not too busy for the background. If you can, have the group photo at the beach, park, garden, or other places where there are wide open spaces for the background. Whether or not you use a tripod, keep one handy just in case. Taking shots with a tripod prevents your camera from shaking. You can also take a bunch of shots with similar focal lengths and angles using a tripod. Keep in mind that not everyone will be the same height and plan your photoshoot accordingly. Using chairs, stairs, a slope or tree branch ensures that everyone will be seen in the final shot. Have fun creating a unique shot taking advantage of the surroundings while keeping everyone in the picture. 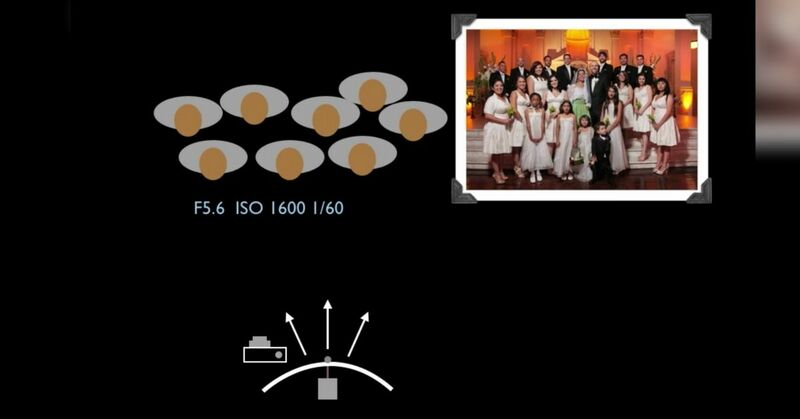 You may want shoot using a few aperture and lens lengths until you get the right one for your group photos. To start, use a 50mm lens with an aperture of f/9. Make sure there is plenty of room between the people and the frame to avoid anyone looking too wide in the photograph. Have everyone check each other's faces and clothing, in case there is dirt or some time of unwanted spot that might show up in the final picture. You want this done, especially if there are children in the shot. This will prevent you from spending too much time adding touch-ups to the photographs. Keep some paper towels or tissues in your camera bag, just in case. Once everyone in your group shot is positioned the way you want them to, start taking pictures. Make sure focus, depth of field and exposure are set and ready. Once your camera is ready, put it in continuous shooting mode and shoot away. You can have everyone close their eyes and open them again at the same time, to avoid blinks in your shot. Remember, experiment with these methods and have fun taking pictures of large groups.